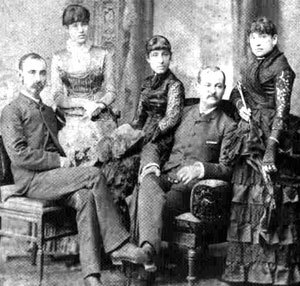 Left to right: Josiah Settles, Fannie Settles, Mary Church Terrell, Robert R. Church, Sr., and Anne Wright Church. Robert R. Church Sr., noted Memphis businessman, philanthropist, community activist, and political leader, was born in Holly Springs, Mississippi, in 1839, the son of Charles B. Church of Memphis, who owned several Mississippi River steamboats. His mother, Emmeline, lived with a family in Holly Springs and died when Church was only twelve years old. Church then lived with his father until adulthood. In his early years he was a cabin boy, later becoming a steward. During the 1860s Church established himself as a successful Memphis businessman. At various times he owned a saloon, hotel, restaurant, and real estate investments. During the Memphis race riot of 1866, a white mob attacked Church’s saloon, shot him, and left him for dead. Church recovered, however, and refused to leave Memphis, despite the violence. Church stayed in the city during the terrible yellow fever epidemic of 1878 and was able to invest cheaply in local real estate. When Memphis was reduced to a Taxing District, Church was the first citizen to buy a bond, for one thousand dollars, to restore the City Charter. In 1899, for example, Memphis lacked public parks for black citizens. Church bought a tract of land on Beale Street, built an auditorium, landscaped the grounds, and called the venture Church Park and Auditorium. The modern auditorium seated two thousand people and was a cultural, recreational, and civic center for African Americans. It was the only venture of its kind in the United States owned and operated by a person of color for members of his race. W. C. Handy, who later became famous for creating the blues, was employed as orchestra leader at the park and auditorium. In 1902 President Theodore Roosevelt spoke to ten thousand people gathered at the auditorium and on the grounds. His appearance acknowledged Church’s political prominence. Two years earlier, in 1900, Church had been a Memphis delegate to the Republican National Convention which had nominated William McKinley for president and Roosevelt for vice-president. In 1906 Church founded the Solvent Savings Bank and Trust Company, the first black-owned and -operated bank in Memphis. The bank survived the financial panic of 1907, which closed older and larger banks. To ward off a bank run, Church placed sacks of money in the bank’s windows with notes asserting that he had adequate reserves to pay off depositors. Church married twice, and two children were born to each marriage. His first marriage, to Louisa Church, ended in divorce. Their daughter, Mary Church Terrell, became one of the South’s most prominent black women of the early twentieth century. Church married Anna Wright in 1885, and they became the parents of Robert Jr. and Annette. Article Title Robert R. Church Sr.